Galvanic corrosion – an electrochemical process that occurs when two dissimilar metals are in close proximity to, or in contact with, one another. When two different grades of stainless steel were used to make the clamp on the left, galvanic corrosion destroyed the clamp. It seems like a decade ago that the pressure treated wood industry gave in to claims that the metals in the treatment chemicals were causing the joist and beam hangers, and even the nails and bolts, to rust through. Some of the metals were arsenic and copper. The industry changed the makeup of the chemicals and slowed the rate of corrosion. When those claims were first made, the world’s leading manufacturer of construction fasteners and components reacted by “triple galvanizing” their products. According to an Osmose, Inc. chemical engineer, it just made the galvanizing fall off in bigger chunks. 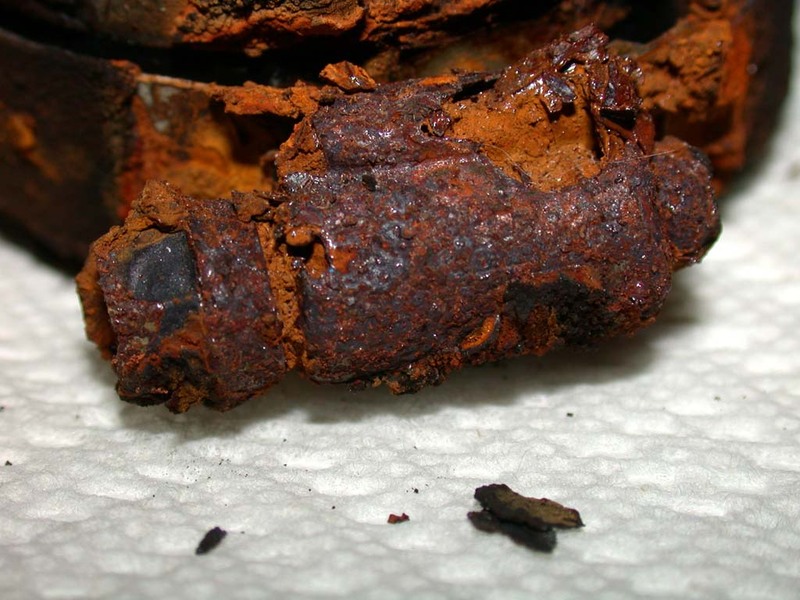 “The driving force for corrosion is a potential difference between the different materials. The bimetallic driving force was discovered in the late part of the eighteenth century by Luigi Galvani in a series of experiments with the exposed muscles and nerves of a frog that contracted when connected to a bimetallic conductor. The principle was later put into a practical application by Alessandro Volta who built, in 1800, the first electrical cell, or battery: a series of metal disks of two kinds, separated by cardboard disks soaked with acid or salt solutions. This is the basis of all modern wet-cell batteries, and it was a tremendously important scientific discovery, because it was the first method found for the generation of a sustained electrical current. The principle was also engineered into the useful protection of metallic structures by Sir Humphry Davy and Michael Faraday in the early part of the nineteenth century. The sacrificial corrosion of one metal such as zinc, magnesium or aluminum is a widespread method of cathodically protecting metallic structures.